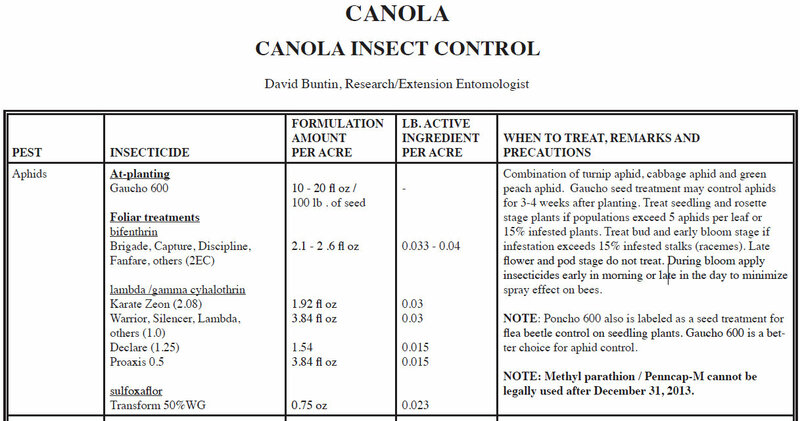 I remember that when we grew canola back in the early nineties it seemed like we had to spray for aphids a fair amount. In the past few years we have had limited acreage but we haven’t seen a whole lot of aphids. 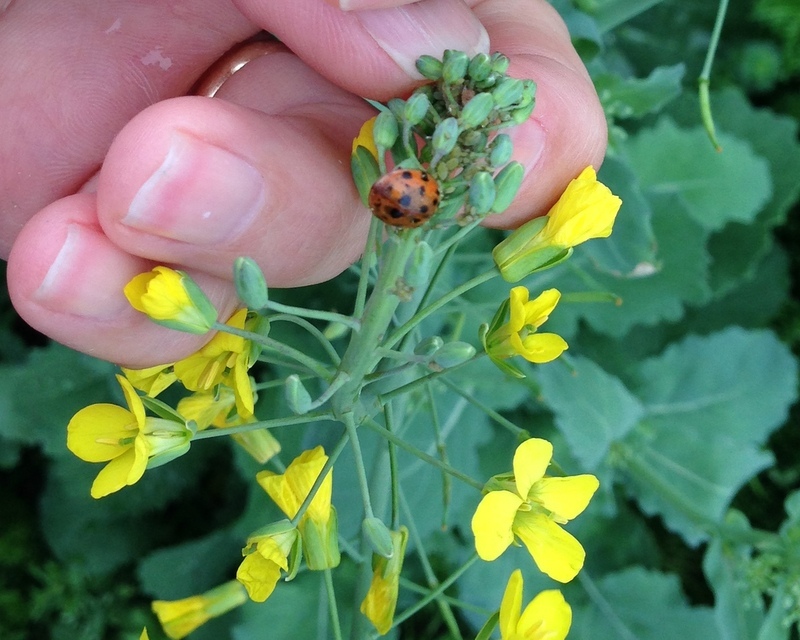 We are seeing some aphids now in canola. Fields I’ve been in lately weren’t at treatable levels but we need to be on the lookout, and treat if needed. Here ‘s a photo I took recently of an infested stalk. Treat seedling and rosette stage plants if populations exceed 5 aphids per leaf or15% infested plants. 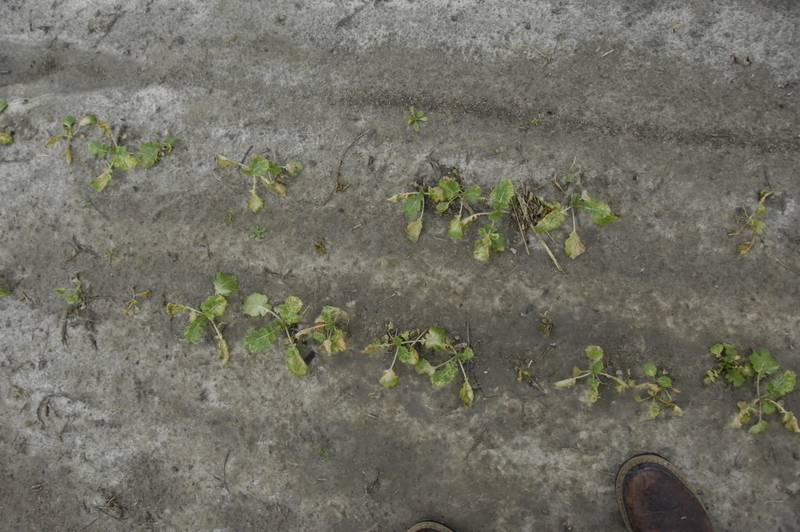 Treat bud and early bloom stage if infestation exceeds 15% infested stalks (racemes). Late flower and pod stage – Do not treat. During bloom apply pesticides early in the morning or late in the day to avoid harming bees. A little natural predation going on here, ladybugs love aphids. We are starting to see Sclerotinia Stem Rot in Canola now. It can be a very serious disease here in the winter. Fortunately we don’t see it in our summer crops this far south. We often spray a fungicide to help control it. Consultant Wes Briggs sent me this photo yesterday showing the readily apparent problem. He says he has been seeing a fair amount of it this week. He saw some last week. 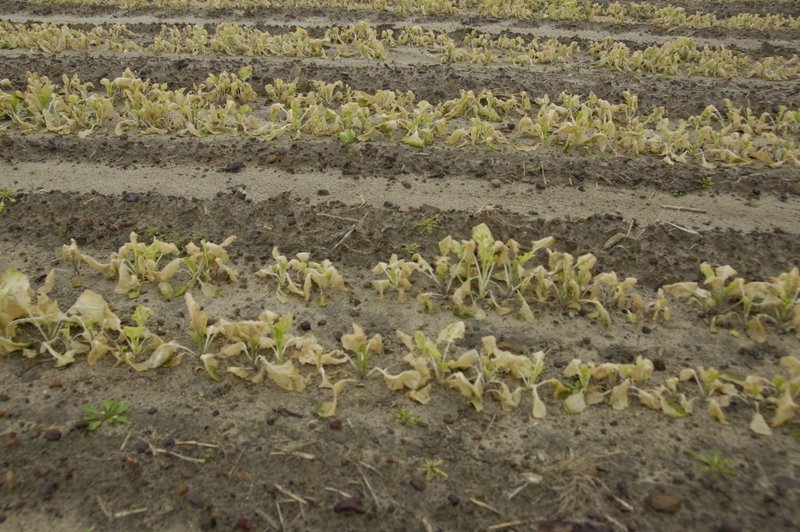 Sclerotinia stem rot, also known as white mold, is caused by the soil-borne fungus Sclerotinia sclerotiorum. It has a wide host range and can attack almost any broadleafed plant, but it is not a problem on grasses. This fungus is active only during cool, wet weather. In Georgia, the fungus is active only during the winter months and has never been a problem on any of our summer crops, although it has been present in the soil throughout Georgia for many years. 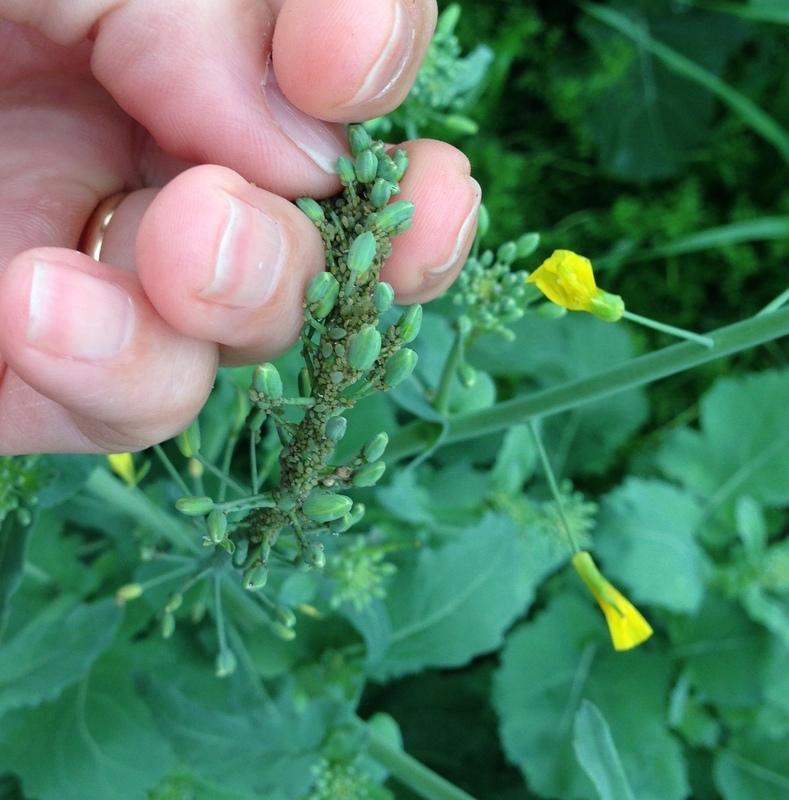 Infections on canola have not been observed before December, and new infections are rarely seen after April. 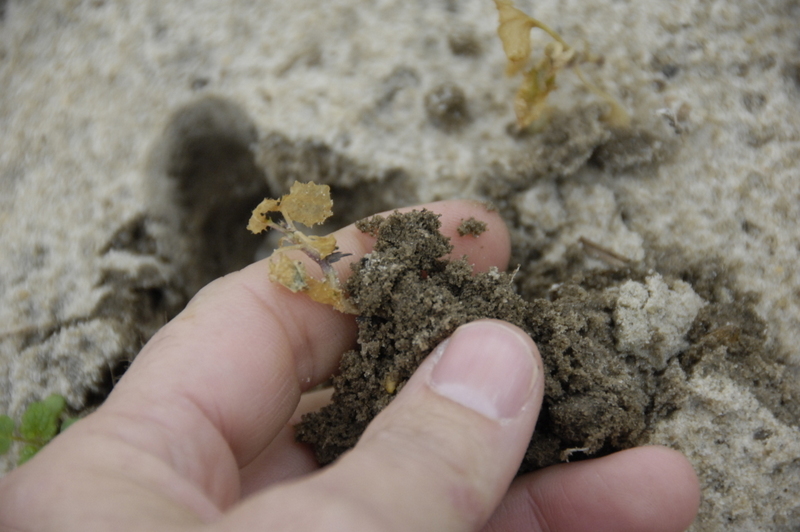 The fungus survives the hot summer months as sclerotia in the soil. Sclerotia can survive for a year in southern Georgia soils and for up to 2 years in northern Georgia with no decline in viability. Viability declines over subsequent years. Any time during the winter, if the soil becomes very wet for several days, sclerotia can germinate in two ways: by producing mycelium in the soil or by producing small mushroom-like apothecia that produce spores above the soil surface. These spores are disseminated by wind and rain to other parts of the field or to adjacent fields. 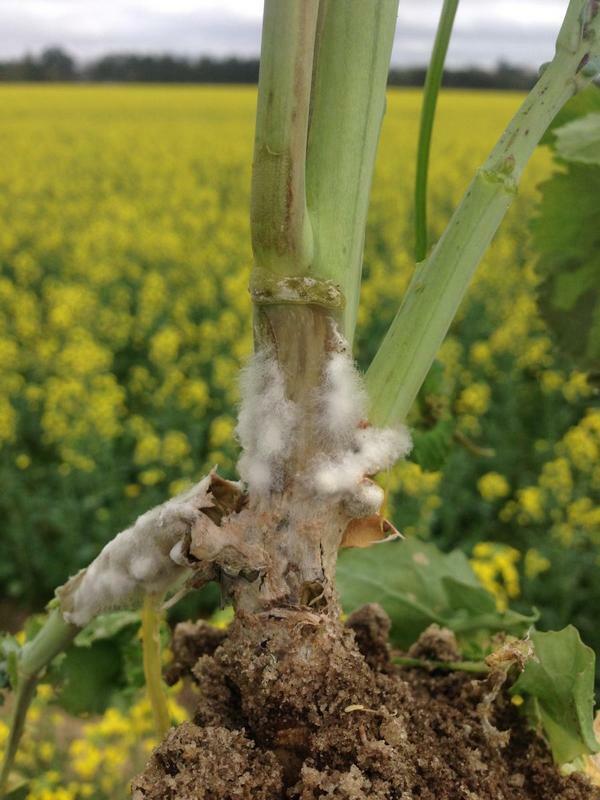 Neither the mycelium nor the spores can invade a healthy canola plant directly. Both must become established in dead organic matter in contact with healthy tissues to initiate disease. Once a disease lesion is initiated, the fungus secretes acids and enzymes that kill additional plant tissues. The fungus can rapidly destroy small plants or girdle the stem of large plants if the weather remains wet and cool. 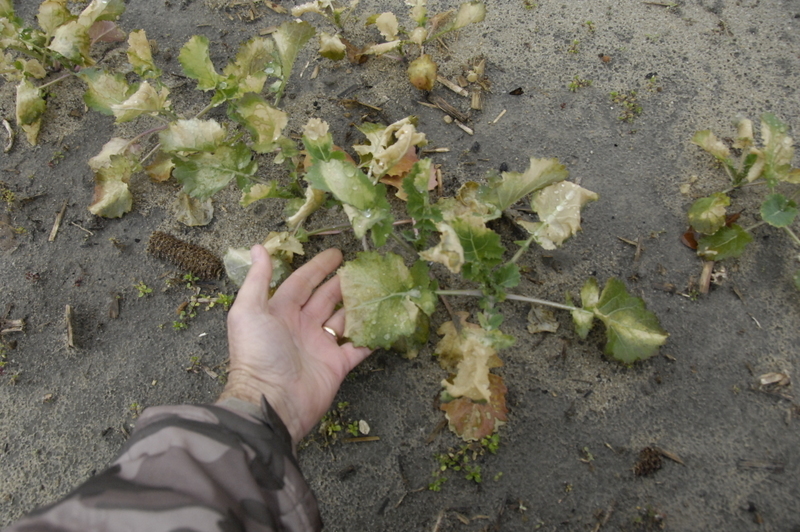 There are no canola cultivars with resistance to stem rot and, in very wet seasons, some plants may be killed in any field in Georgia. 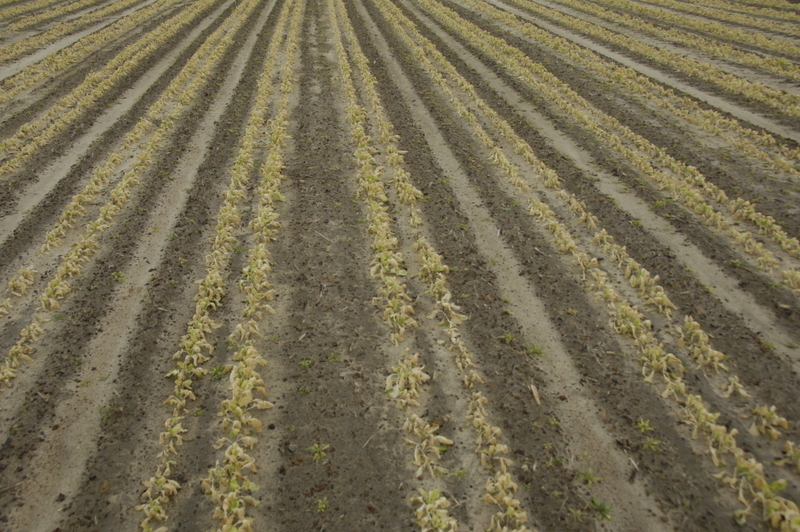 In drier years, fewer plants will be killed by this disease. Poorly drained fields suffer losses much more frequently than well-drained fields. The most important control measure is to select well drained fields that have not had canola or another susceptible crop for the past two winters. We had some low temperatures a week ago, 18 degrees, and we had damage to Canola and Carinata. A week later is a good time to assess the damage to see if the growing point is alive. Often leaves are burned back and killed but the growing point survives and the plant regrows rather quickly as it has a good rootsystem to help it bounce back. I looked at several fields this week and we do have some plant death, mainly in replant fields where the plants are very small and more susceptible to damage. Or, also we see it where we have small plants intermingled with larger plants for some reason. You can have some areas of fields affected worse as well like a bottom where it got slightly colder. On the larger plants the effect is startling and looks terrible. The field looks white in some cases. It is bad and will set the plants back, but if they survive, they will regrow new leaves. So it really looks worse than it is in some cases. In most of the fields I’ve been in we have pretty good survivability. I can see green growth at the center of the plant, the growing point. Dr. Steve Olson, who is helping with the Carinata project, reports that some of those fields will have to be replanted. He mentioned that a good way to tell if plants are alive is to tickle them to see if they move back and forth, if they just go to one side and kind of collapse that’s not good. Here’s a casualty of the cold temperatures.